Summer can be a grueling experience for those without the luxury of home air conditioning units. As if that fact wasn't enough, many homeowners or renters alike who do have a central AC units choose not to use them due to how expensive it is to operate an AC unit throughout several months of heavy use. And if you have a unit that's more than 15 years old... Forget about it! As efficient as newer AC units are getting, you can't beat the cheap and hard working ceiling fan. Studies have shown that installing and using ceiling fans instead of your home AC can save you up to 30% on cooling costs of summer cooling use according to some estimates. If that isn't enough, a good ceiling fan adds aesthetics and increased value to your home. Ceiling fans can be had for as little as $20 to $50 depending on home improvement store specials for a basic model and go up from there. 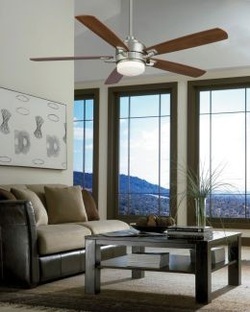 Ceiling fan blade spans range from 29 – 54 inches, the most popular being the 52-inch model. To figure out what size best fits your needs, start by measuring the 2 walls and multiply that number to get your square footage. As you stand in one corner of the room you are planning to add as ceiling fan in, measure the length of the wall to your right and then measure the length of the wall to your left. As an example, we'll say that one wall measures 12 feet and the other wall measures 10 feet. You multiply 12x10 and you get 120 square feet. Using the chart below you can see that you will need a fan sized between 36" and 42". See the chart below to see what you need. Max Handyman can professionally install your ceiling fan and guarantees it for 12 months.